High school student Sierra Burgess (Shannon Purser) isn't popular. At all. Despite that, she's relatively ~okay~ with her life. She's smart, she can stand up to bullies, and she hangs out with her best friend Dan (RJ Cyler). Until, that is, hot guy Jamey (Noah Centineo), the quarterback of the rival football team, starts flirting with her through text. The only problem? It's a case of mistaken identity because he thinks Sierra is resident mean and popular girl Veronica (Kristine Froseth). Instead of correcting him, Sierra works out a deal with Veronica to continue the lie: Sierra will help Veronica not to flunk her classes, and Veronica will lend her face so that Sierra can continue the fake relationship with Jamey. "I was kind of just relying on our generation's total disregard for basic human interaction." Sierra Burgess Is a Loser is a love story for our generation and it perfectly captures the awkward and tricky part of online relationships (and how much we actually depend on our phones). We know Shannon as Barbara "Barb" Holland in the first season of Stranger Things and as Ethel Muggs on Riverdale. Noah became a household name thanks to his role in Netflix's To All The Boys I've Loved Before where he played the dreamy Peter Kavinsky! Norwegian actress and model Kristine starred in 2017's Rebel in the Rye and Prey. RJ is known best for playing Bill Cranston aka. the Blue Ranger in 2017's Power Rangers film. He also appeared in Everything, Everything and White Boy Rick. Actress Shannon Purser actually had her first on-screen kiss in this movie! And it was with Peter K/our Internet boyfriend, Noah Centineo. WHOA. Sierra Burgess is a Loser is based on the classic play, Cyrano de Bergerac. But while the two share some similarities, they're actually pretty different due to the settings and the time they take place in (there were NO smartphones involved in the play). Noah shot Sierra Burgess is a Loser before To All the Boys I've Loved Before. In the film, we hear Shannon sing a track called "Sunflower." The song is special for the film's screenwriter Lindsey Beer because it's based on lyrics she wrote when she was a teen! Noah says he actually relates more to goofy Jamey (who, BTW, doesn't have a last name) than to cool and suave Peter Kavinsky. 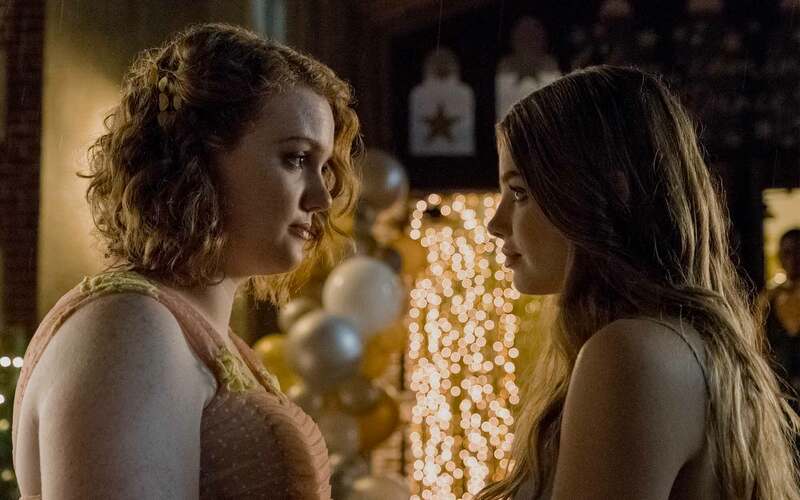 What I loved most about Sierra Burgess was that there was no transformation sequence. Unlike classic rom-coms such as She's All That and Princess Diaries, Sierra didn't remove her glasses and ~magically~ transform into the "attractive" lead! She was imperfect, she didn't meet the world's standards of "beauty," and that made her relatable to me. We've all had days when we felt socially awkward, days when we hated how we looked, and moments when we wished we could swatch faces and bodies with someone else. And I felt like the film captured that. I wanted to watch it for the ~kilig~ but I ended up loving it even more because of the friendship between Sierra and Veronica (although it was nice seeing Noah again). They gave the popular, mean girl depth. Veronica wasn't shallow or stupid, she had her own story and her own problems. "20,000 followers; following zero." It just goes to show how much of social media is made up. The film showed what it's like to talk to someone online (maybe if our parents watched this film they'd finally understand): the agony of waiting for a reply, wondering if you said the right thing, lying on your bed erasing and editing and finally sending that message even though that's not what you really mean. I also have a really soft spot for movie soundtracks and the Sierra Burgess song "Sunflower" made me feel sad and happy and hopeful all at the same time! Everyone who's ever felt like they're real-life Sierra Burgesses. You are all magnificent beasts, and you are loved. This film will make you feel like a beautiful sunflower (watch it)!